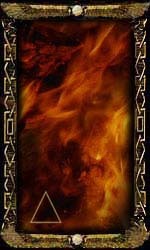 In Tarot - at least in all the decks derived from the tradition of the Golden Dawn - each card is signified by one specific element. 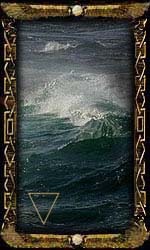 Apart from the apparent influence on the card itself these elements also modify the significance and even the meaning of a card dependent on the surrounding cards. Say, for example, you have the Six of Swords. 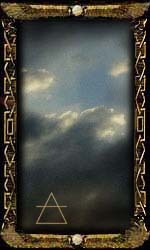 The card - itself belonging to the element of Air - will shift slightly under the influence of the neighboring card(s). It does make a difference whether this neighboring card is ruled by Fire, or Water, or Earth, or by Air as well. These are the traditional symbols of the elements, I just filled them up so they can be easier recognized. The very forms of the elemental symbols help to memorize their attributes - those who point upwards are active, those who point downwards are passive. Also mind the bar in the symbols of Air and Earth - the same shapes go well together if they point in the same direction; if they point in different directions there should be one in a pair with a bar in it, but not two. Two symbols with a bar pointing in different directions are as much 'a negative combination' as two symbols without bars pointing in different directions. However, the peculiar habit of simply disregarding cards as 'irrelevant' because their elemental dignities appear to neutralize them seems a bit over-the-top to me. Going as far as not reading such cards is like pouring out the baby with the bath. No card in a spread is ever irrelevant, it can just be that it is not as important as others. Here the elemental dignities help to determine the strong and important cards, yet this should be done without trashing the rest. Further, when going to the explanations below you will see that it is a tad too easy to just say 'This and that element weaken each other' or 'This and that element are a friendly combination'. As usual in Tarot, things are not as simple as you would wish them to be. A Fire card influencing a Water card is a different matter than a Water card influencing a Fire card. What appears to be a 'weak' combination at first sight could be the last straw to hold on, and the most 'friendly' pairing could be a desastrous match. See below a list of how each element will act when influenced by another one. These are sixteen combinations that you will have to memorize when they are the basic of the steps that will follow later. While it might seem confusing in the beginning it will help to realize that the elements have distinctive characters to which they will stay true. After a while you just know them. Fire and Fire intensify each other, be it for good or for worse. Action and energy get enhanced, but also destruction and oppression will be harsher. Every card is stronger when accompanied by a card of the same element. Fire gets quite good impulses from Air, adding an intellectual touch to its archaic energy. Both elements are active yet somewhat loose which could result in a loss of stability. Fire acted upon by Earth will find fuel and stability the same time - provided the Earth is not too much. 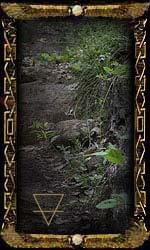 If the Earth card is too strong it can hamper the spirit of Fire with rather unwanted ballast, thus dragging it down. Fire and Water is a hapless combination, they simply do not get along with each other. In some rare instances it could be that the Water provides an emotional base for the imbalanced Fire, but in 99% per cent the Fire simply gets weakened or even extinguished. Water and Water go very well with each other, perhaps too well - when there is passivity all over and no incentive to move on at all. If all cards are good it can be a pleasant drowning in bliss, but with not so good cards it just means indolence. Water influenced by Earth is usually very lucky when the stable Earth provides a secure foundation as well as a thankful receiver for the water's fertility. Both elements are passive and are quite happy with not moving too much. Water and Air can make a wonderful couple if they are well balanced. Too much of the active, logical air, however, can result in some stormy turmoil. Water does not like all too much reasoning while Air quickly loses patience with too much sentimentalities. Water getting the heat of Fire definitely is not happy, for the most part it just feels disturbed and hates the intruder. It can be, though, that the placid Water just needs a wake-up call to drag its behind out of dreamland, but it still won't be delighted by the annoyance. Air and Air are of course one of a feather and harmonize perfectly, sharpening and increasing their intellectual reasoning and activity. However, the combination of Air and Air can lack a certain stability and/or practicability. Fire is quite a beneficial companion for Air, giving power and passion to the active mind, fuelling the intellectual flights with some real creative spark. Yet, even best buddies can become a drag at times - the Five of Swords empowered by a strong Fire isn't exactly good news. Air and Water can make a loving couple, with the Water adding some much needed emotion and compassion to the rational analytic. Of course, it always depends on the cards how benevolent the influence might be - Seven of Swords modified by the Eight of Cups... ouch. Earth is certainly the least welcomed influence by Air, even though at times it might provide some stability to the restless mind. Yet more often than not the combination is unfortunate since the bulky, passive Earth will simply drag the Air down and put it in restraints. Earth and Earth might be happy with each other, forming a big heap of clay and stone and sand, not moving, not acting. Solid, stubborn, unmovable. Practical and stable to the point of dullness. This might be great if you are looking for security but.. kinda boring, too. Water is a most beneficial modifier for Earth, providing the thick ground with fertility and moisture, adding emotion to the unmoved material. Too much water, however, can create a swamp. Fire provides an often needed spark of spirit and vitality to the Earth, act as an uplifting, active force and bring the Earth to movement and recreation. Fire can also burn the Earth down to the ground and yet this is what kept the Earth regenerating time and time again. Air could be another force to get the rigid Earth to move but unlike Fire it does not know how to make itself understood. Earth cannot wise up on the Air's intellectual snide remarks and just never knows what this nervous thing wants. The Air is rendered irrelevant, the Earth remains in stupor.